PATH releases guidance and tools for advocates who want to mobilize support for commodity-based strategies in their own countries. 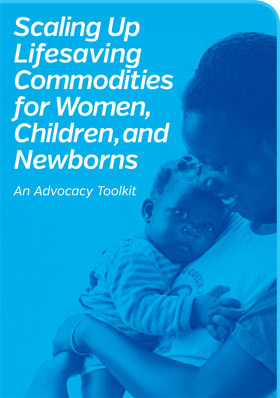 Recently global health nonprofit PATH released Scaling Up Lifesaving Commodities for Women, Children, and Newborns: An Advocacy Toolkit, in conjunction with other members of the Advocacy Working Group for the UN Commission on Life-Saving Commodities (the Commodities Commission). The toolkit includes information on the Commodities Commission, an overview of the 13 priority commodities, key recommendations for scale-up of commodities and examples of how these recommendations are currently being applied at global and national levels. It also offers guidance and tools that advocates can use to mobilize support for commodity-based strategies within their own countries. The Commodities Commission was formed in 2012 as part of the Every Woman Every Child movement to increase access to, and use of, life-saving medicines and health supplies in the geographies in which the most women and children under-5 die each year. In September 2012, the Commission released a report that listed 13 reproductive, maternal, newborn and child health commodities that can prevent and treat many of the leading causes of death in target countries. The evidence suggests that increasing access to these commodities could save the lives of six million women and children within five years. The medicines and health supplies are affordable—the majority cost less than US$1 per dose—yet they remain out of the reach of those who need them most. Access the toolkit to find out more about the Commodities Commission, its recommendations and how you can engage stakeholders and decision-makers around this critical issue.